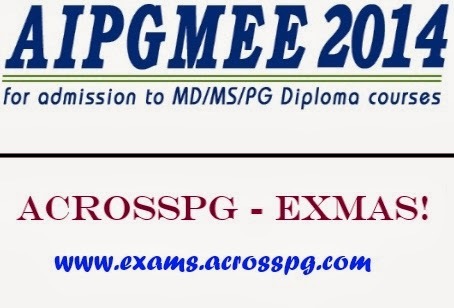 AIPGMEE 2013 - Important details and points - AcrossPG Exams! 6. Exam Dates: The examination shall be conducted from 25th November – 6th December, 2012, which is referred to as the testing window (with 26th, 29th November and 1st and 4th December as non-testing days). 10. Scheme of AIPPG Exam: Exam will be MCQ type. · Total timing for test is 3 hrs 30 min with 15 min for demo. · The weightage of MCQ’s in each specialty is indicative and purely provisional. NBE reserves its right to alter/vary/amend the same. · *Candidates who have obtained their Primary medical Qualification outside India and do not have SMC/MCI registration should bring their original screening test pass certificate issued on NBE letterhead. · **The name on your photo identification must match with your name as shown on your Admit card. If your name has been changed due to events such as marriage, you must show the relevant document mentioned below at the time of test. 13. Result: Result for AIPGMEE is likely to be available on the website www.nbe.gov.in/AIPGMEE by 31st Jan 2014.